Running Back Melvin Gordon of the Los Angeles Chargers. LOS ANGELES—The Los Angeles Chargers were defeated by the Los Angeles Rams in the battle of Los Angeles. The Chargers trailed most of the game and were overpowered by the Rams in the end. The Rams started the game with the ball. On what looked to be a promising drive, the Rams turned the ball over on a fumble. Running back Todd Gurley was responsible for the fumble and cornerback Desmond King recovered the ball. The Chargers were unable to capitalize on the momentum. They went three and out, giving the ball back to the Rams. On the Rams next drive, they would put points on the board. After methodically driving down the field, quarterback Jared Goff found Brandin Cooks on a post route to get the team to the 1-yard line. Gurley finished the drive by rushing for a 1-yard TD. The Chargers would respond quickly, though. On 2nd and 12, quarterback Philip Rivers found wide receiver Mike Williams for a diving catch that resulted in a 42-yard TD. Kicker Caleb Sturgis would miss the extra point, making the score 7-6. In the 2nd quarter with the Rams driving again, the Chargers forced a turnover from their crosstown rival. Rookie safety Derwin James intercepted Jared Goff and returned the ball to the Chargers’ 4-yard line. The Chargers would go three and out on their following drive. On 4th down, the Rams blocked the punt and recovered the ball in the end zone. The score was 21-6. Rivers led his team down the field one more time before the half. With little time left in the second quarter, he connected with tight end Antonio Gates and wide receiver Keenan Allen for gains of 27 and 25 yards respectively. Running Back Melvin Gordon ended the drive with an 11-yard scamper. The halftime score was 21-13. The Chargers received the ball to start the second half, but, on their fourth offensive play, Keenan Allen fumbled and free safety Lamarcus Joyner of the Rams recovered. Goff would find wide receiver Cooper Kupp on a 53 yard pass to make the score 28-13. Once again, though, the Chargers would respond. Rivers once again drove his offense down the field. On 4th and 2, he found Williams for his second TD of the day, bringing the score to 28-20. On the ensuing drive, the Rams started with the ball on their own 23-yard line. A pass of 45 yards to Gurley helped the team get good field position. To finish the drive, Goff found wide receiver Robert Woods for a 6-yard TD, bringing the score to 35-20. Neither team scored a touchdown in the 4th quarter, with the Chargers only adding a field goal to their point total. The final score of the game was 35-23. The Chargers will have a chance to reach .500 next week at home against the SF 49ers. RB Todd Gurley (LAR) finished with 23 carries for 105 yards with 1 TD. QB Jared Goff (LAR) finished 29/36 for 354 yards with 3 TDs and 1 INT. WR Robert Woods (LAR) finished with 10 receptions for 104 yards with 2 TDs. 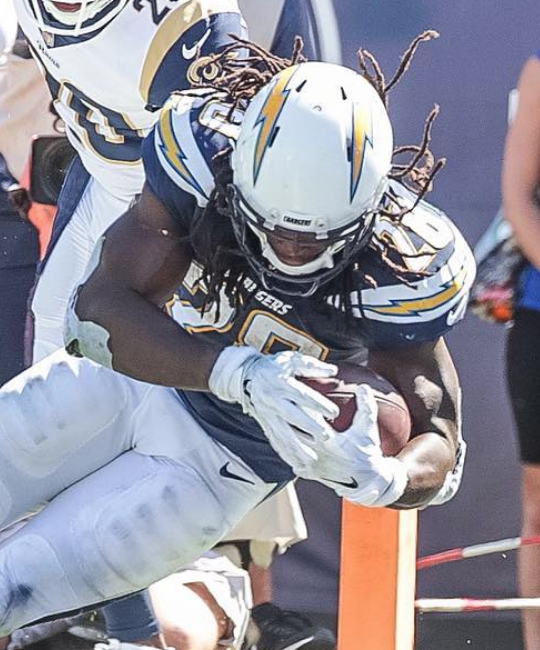 RB Melvin Gordon (LAC) finished with 15 carries for 80 yards and 1 TD. QB Philip Rivers (LAC) finished with 226 yards with 2 TDs. WR Mike Williams (LAC) finished with 4 receptions for 81 yards with 2 TDs.